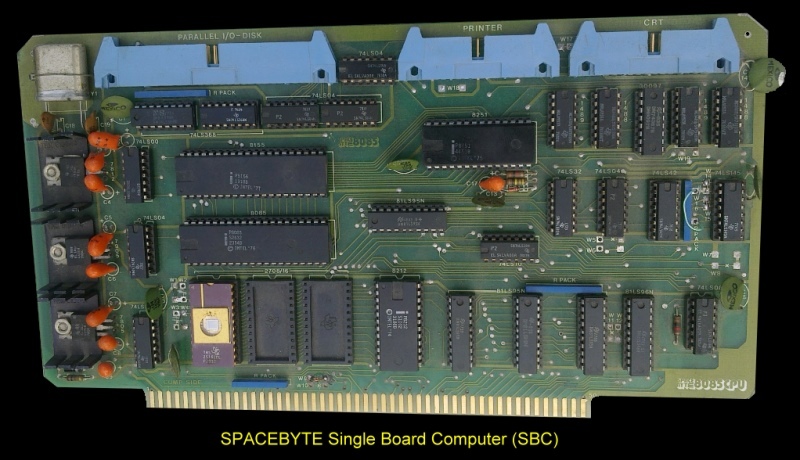 As far as I know this is the only S-100 Board Space Byte made. They appear to have arrived on the S-100 board scene late. If anybody knows of other boards please let me know. Except for CompuPro and IMASI, I think this was the only other 8085 based CPU S-100 Bus card. The board was to create a single board computer containing all the necessary I/O support for a small business system. It has an 8085 CPU, a serial port, a hardware timer, parallel ports, and a "ICOM FD3700 FDC interface" for connections to 8" (single density) floppy disk drives. There was a decent amount of EPROM support (2808 or 2716's), and Space Byte supplied in their monitor support to read a Tarbell cassette, and a Polymorphic Video board. The manual for this board can be seen here and here.